* Updated Google+ to new version. * Added "Privacy & Policy" checkbox for register popup (Required for some countries). * Added "Exit Popup" option. - Added PrestaShop 1.7 compatibility. - Now you can use different popups for each product and category page without overrides. - Added all content types for product and category pages. - Export all customers signed in with social networks. - Lots of improvements and fixes. - Added newsletter sing up checkbox for Login and Register popup. - Updated Facebook app instructions video. - Fixed: Facebook API update. - NEW: Added statistics for social connects. - NEW: Added redirect option for social connects. - NEW: Added background image option for login and register popups. - NEW: Added PrestaShop 1.6.1 compatibility. - Fixed: Newsletter popup was not working on custom hook and product page. - Fixed: Error notification when adding new product. - Fixed: Facebook connect wrong scope. - Fixed: Module was changing some theme styles. - Fixed: Warning message in module configuration page. - NEW: Add Background image for popups. - Fixed: Newsletter popup was not closing after subscribtion. - Fixed: Newsletter subscribtion bug when subscriber removed from block newsletter module. - Fixed: Newsletter popup improvements. - Fixed: Fixed product page popup cookie issue. - Fixed: Some texts was not translatable. - Fixed: Html editor was not working on PrestaShop 1.6.0.13. - NEW: Added new content type (Image). - Fixed: Twitter connect was not working when user name is 1 word. - NEW: Added Google+ connect. - Fixed: Newsletter subscription styling. - NEW: Added Login form. - NEW: Added Register form. - NEW: Added Facebook connect. - NEW: Added Twitter connect. - Fixed bug: Product page facebook like box url was linked to home page. - NEW: Send Email generated voucher code. - NEW: Newsletter Subscription with coupon. - NEW: Added full support for PrestaShop 1.6. - NEW: Added 5 different animation effects. - NEW: Start and end days for popups. - NEW: Display popups with delay. 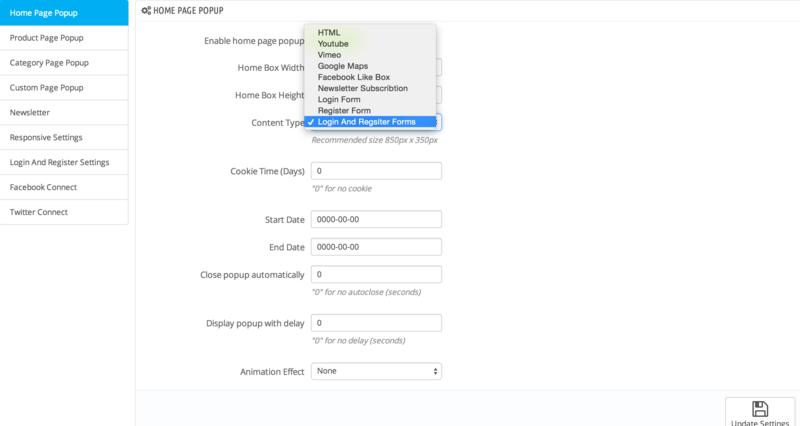 - NEW: Set time for popups autoclose. - NEW: PrestaShop 1.6 compatibility for home page popup. - Fixed bug when adding only image. - Added custom popup with custom hook. - Added feature for adding different popups for each product. - Added 5 different content types (html, youtube, vimeo, google maps, facebook like box).